As August comes to an end the early and mid-summer herbaceous borders are really looking tired and faded. This is the time that the late summer flowers come into their own with a final salute to summer. One plant stands head and shoulders over the others at this time of year for its dazzling show and the longevity of its flowering period. That is Rudbeckia. One of the best daisies in the garden, it originates from North America. These are easy to grow as long as you have a humus rich, moisture retentive soil and slowly spread by the production of rhizomes. 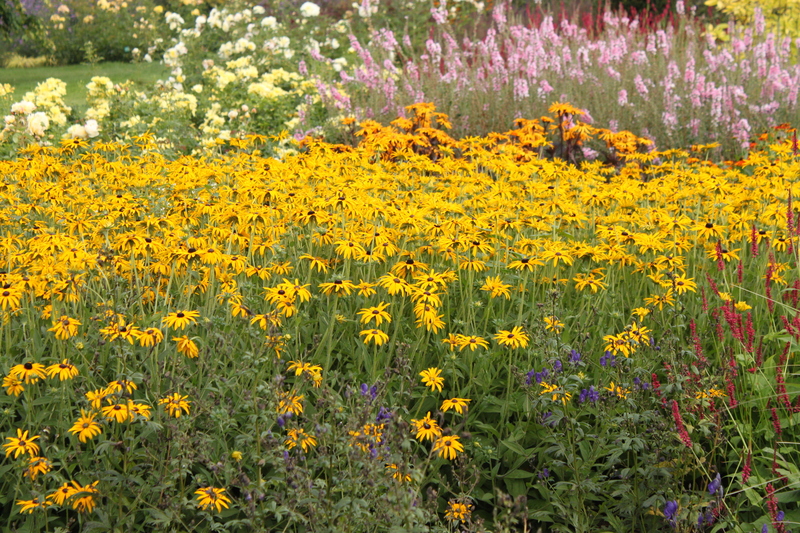 Two of the most commonly available varieties are Rudbeckia fulgida ‘Goldstrum’ and Rudbeckia fulgida ‘Deamii’. The former has a tight habit that creates a solid mass of flowers where Deamii has a looser habit. Rudbeckia laciniata ‘Goldquelle’ is a double variety looking not unlike a Zinnia growing to around 60cms tall. 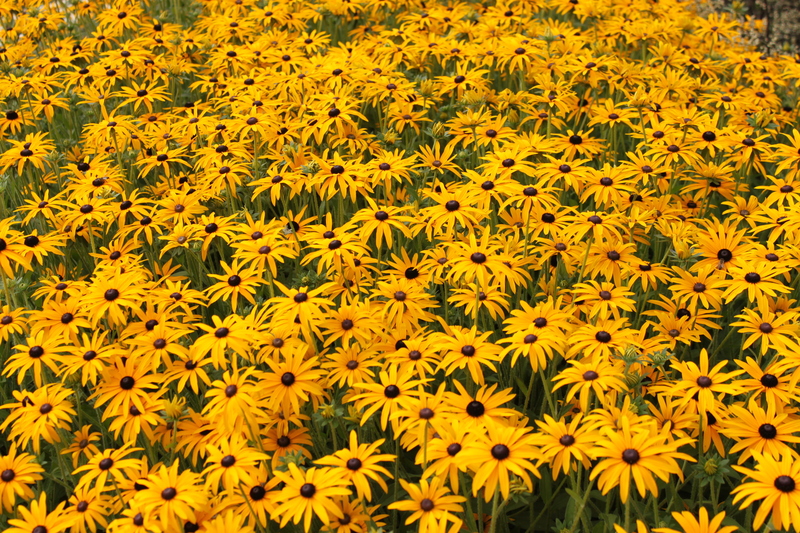 If a taller version is appropriate, Rudbeckia ‘Herbstsonne’ ‘Autumn Sun’ or ‘Juligold’ grow to over 180cm in height. Both of the single varieties have wonderful deep yellow petals surrounding a solid black central cone (Thus the common name – the Cone Flower). They are sometimes referred to as the Black-eyed Susan, however so is Hibiscus trionum and Thunbergia alata, so not the best way of referring to them. Rudbeckias are great plants to partner with. 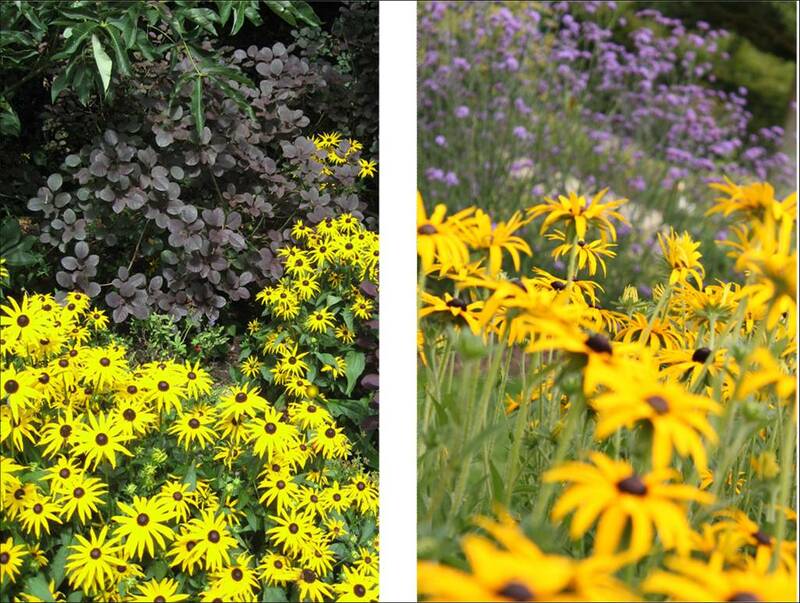 In a classic gold/purple bed, Rudbeckias are stunning when grown with Verbena bonariensis or Perovski atriplicifolia. In a hot bed, they can hold there own alongside the brightest Kniphofia. Planting alongside a dark purple leaved Cotignus ‘Palace Purple’ adds drama to an uninteresting corner of the garden. They continue to bloom well into October and simply needs chopped down ready to treat us to another show next season.